After a picture-perfect launch Tuesday, a commercial cargo ship built by SpaceX made a close flyby of the International Space Station early Thursday, approaching from behind and below for a successful series of tests to make sure the capsule's navigation, flight control and communications systems will work as required when the spacecraft moves in for berthing Friday. There were no technical problems of any significance during the Dragon cargo ship's "fly under" Thursday and if all goes well, flight controllers in Houston and at SpaceX's Hawthorne, Calif., control center are expected to maneuver the cargo ship to within just 30 feet of the station early Friday, carrying out a final series of tests along the way. At that point, flight engineer Donald Pettit, operating the lab's robot arm, plans to lock on and pull the Dragon capsule in for berthing around 11:30 a.m. EDT (GMT-4). "Today went really very close to how we had trained it," said NASA Flight Director Holly Ridings. "There were no major deviations from our pre-flight plan and really nothing that we saw that we had not discussed prior to the mission." SpaceX Mission Director John Couluris was equally pleased, saying "we fly by the mantra of 'train like you fly, and then fly like you train.' And so far, the mission has been proceeding just like a regular simulation, so we're very pleased about that." Asked how he felt about the prospects for maneuvering the spacecraft to within a stone's throw of the space station Friday to clear the way for berthing, he said "I don't want to jinx myself and say what I expect and then see something different. But right now, the mission is looking just like our simulations and I'm not expecting anything we haven't seen in a simulation." 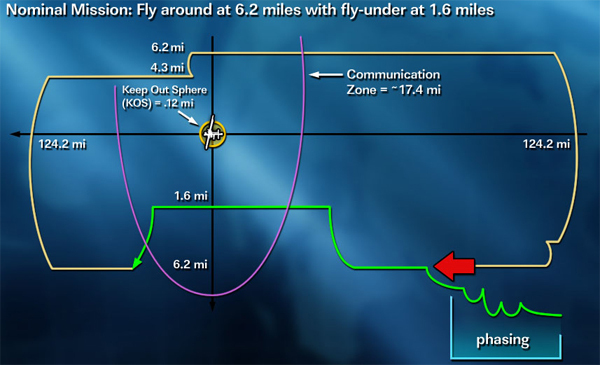 The terminal phase of today's close approach began at a point 6.2 miles below and well behind the space station. Incorporating data from navigation satellites and the space station to precisely compute its position in space, Dragon's flight computers guided the spacecraft to a point just 1.6 miles below the complex. "The way the two vehicles navigate together is relative, where you get pieces of information from both vehicles and you do the calculation and then they know exactly where they are in space relative to each other," Ridings said before launch "And so we're gathering information to make sure that navigation system works." The fly under "is very important to us because it's the first time the Dragon and the space station will communicate with each other, an absolute requirement for proximity operations," she said. "It's the first time the crew on board the ISS will send commands to Dragon and get a response." The command in question was a simply instruction to turn on a strobe light. As expected, the light came on and engineers confirmed the health of the communications link. "This is just a test command ... but it's leading towards the crew potentially being able to send more invasive commands, such as hold or retreat or even an abort later, and command the Dragon when it's at the capture point." The Dragon spacecraft passed directly below the space station around 7:30 a.m. EDT (GMT-4). After the close-approach fly-under tests were complete, the Dragon dropped back down to a point 6.2 miles below the station. From there, the capsule pulled out in front of the lab on a looping flight path designed to carry it up and over the station and eventually back to a standby position behind and below the laboratory. Early Friday, the Dragon spacecraft will move in for berthing, flying a stepwise automated approach to hold points 1.5 miles and .9 miles directly below the station. After additional tests to make sure the craft can be precisely controlled during final approach, the capsule will be maneuvered to a point just 30 feet below the lab. Pettit then will use the lab's robot arm to latch onto a grapple fixture and move the Dragon to a docking port on the Earth-facing side of the forward Harmony module. Once precisely aligned, motorized bolts will drive home to seal the cargo ship to the docking port. "It is definitely a more intense day tomorrow," Couluris said. "The flyby today allowed us to check out a lot of systems and retire a lot of risk for tomorrow's flight. We were also able to get some additional objectives. We powered up the LIDARs (laser rangefinders) and the thermal imagers, which we use for very close-range navigation to space station. And those checked out good. "So again, we retired a lot of risk for tomorrow. But ... there is more fine maneuvering. 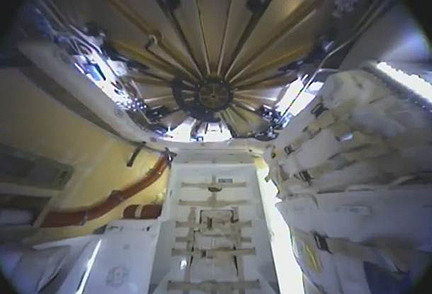 Dragon has a lot of automatic systems on board to protect station and Dragon itself if we see a malfunction. We haven't seen anything that would require those right now, but it is the first time we're using them. It is a test flight and we are being cautiously optimistic." Assuming a successful berthing Friday, the crew plans to open hatches and float into the capsule Saturday to begin unloading supplies and equipment. For the test flight, only about 1,100 pounds of low-priority cargo were on board. SpaceX hopes to begin regularly scheduled cargo deliveries later this year under a $1.6 billion contract with NASA that calls for at least 12 cargo missions. A second company, Orbital Sciences, holds a $1.9 billion contract for eight missions to deliver the same amount of cargo, about 44,000 pounds. NASA's goal is to replace the cargo delivery capability that was lost with the space shuttle's retirement. To save money, the agency implemented a more commercial approach to contracting, giving the companies more say in engineering decisions and flight control. As a result, this week's mission is being billed as the first commercial space flight to the station. NASA and SpaceX initially planned three test flights under a separate contract valued at up to $396 million, but the company successfully lobbied to combine the objectives of flights two and three into a single mission. The test objectives for today's close approach -- navigation, abort and commanding tests -- will meet most of the goals originally laid out for the second test flight. The planned Friday berthing, along with close-in tests during final approach to the station, should accomplish the original goals of the third mission. So far, the flight has proceeded without a hitch. After a spectacular pre-dawn climb to space, the SpaceX Falcon 9 rocket released the Dragon capsule into an orbit with an average altitude of 201 miles, about 1.6 miles lower than expected. That was easily adjusted in a subsequent rendezvous rocket firing. The capsule's solar panels, being tested in space for the first time, deployed normally to provide power and recharge the capsule's batteries and a protective cover over critical navigation sensors was opened as planned. The Dragon started the chase trailing the International Space Station by about 3,700 miles. After four rendezvous burns, the spacecraft was 2,200 miles behind the lab and about 19 miles below. While the rendezvous sequence proceeded, flight controllers carried out a series of abort demonstration tests and another to collect so-called "free drift" data when the thrusters were disabled as they will be at the end of the rendezvous. There were no technical problems of any significance, engineers said. One thruster briefly "failed off," but it later was deemed a momentary glitch and restored to normal operation. Another issue with an inertial measurement unit was cleared up with a navigation update.